Powers/Abilities: Andras presumably possessed most of the classic powers ascribed to vampires, but only displayed superhuman strength and durability, and the ability to turn others into vampires. He was vulnerable to crosses backed by faith, needed to drink blood to survive, and ultimately proved vulnerable to fire. History: (Vampire Tales#6/2 (fb), BTS) - In the mid-1950s, shortly after the Russian invasion of Hungary, the vampire Andras Juhasz began slaying Russian soldiers, leaving their corpses littering the streets of Budapest. When the Red Army moved into Prague, Czechoslovakia, in 1968, Andras moved with them and continued his murders. Soon hunted by the K.G.B., in 1970 he relocated both himself and his killing spree to Vienna, Austria, drawing the interest of both the C.I.A. and Interpol. After barely a year in Vienna, now on the run, Andras fled to the German state of Bavaria. 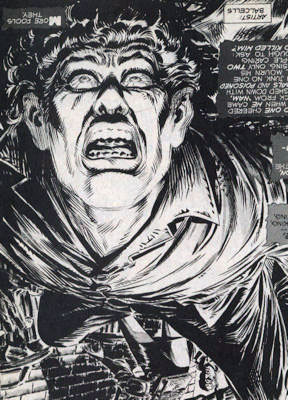 (Bizarre Adventures#25/3 (fb, BTS)) - Andras met and befriended the American Tom Freeman, then stationed in Europe (presumably with the U.S. Armed Forces), and Tom struck a deal with the vampire. (Vampire Tales#6/2 (fb), BTS) - to join Andras in the ranks of the undead, the vampire would slay the junkies and criminals blighting Tom's old neighborhood, Harlem. Around Christmas time, Andras stopped his killings in Bavaria as he relocated to Harlem. Six weeks after Christmas, Andras began his campaign to clean up Harlem's streets (see Comments), soon winning the desperate locals' support. Having been given a cape for Christmas by his sister, Angie, Tom gave it to Andras, who happily wore it. The police believed the killer was a nut with a fetish for blood, but Angie became convinced that the killer was a genuine vampire, especially after six-months of investigating uncovered Andras' European trail of corpses. Angie convinced the police to humor her, putting one of the dead junkies under 24-hour surveillance to see whether he would rise as one of the undead. When he didn't after a week, the police discounted Angie's belief, and when she persisted, noting that the corpse would not arise if he had been dead before his blood was drunk, they grew tired of her pushing her theories at them. Though he shared his fellow cop's incredulity, due to their friendship Sarran still let Angie accompany him when he patrolled Harlem at night, hoping to catch a lead. 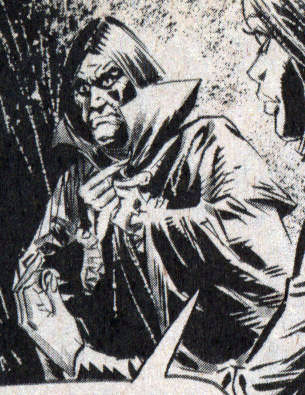 Andras slew a junkie, Willie Hanson, but not before he ripped one of the buttons off Andras' cloak. Leaving Hanson's corpse in an alley, Andras entered the neighboring building and proceeded to slaughter the junkies inside. He threw one out of a window, drawing Angie and Sarran's attention, as they had pulled up after spotting Willie's remains. (Vampire Tales#6/2) - Ordering Angie to return to the car and call for help, Sarran raced inside and up the stairs. Ignoring his instructions, and insisting her editor would kill her if she missed the story, Angie followed. Andras swiftly departed for the roof, leaving the pair to find Andras' latest kills. Hearing Andras' footsteps on the roof, Sarran again ordered Angie, this time to stay put, before he pursued. As Andras made to leap to the adjacent building, Sarran burst on to the roof, ordered him to stand still, the opened fire to no avail. Andras easily made the leap and vanished into the darkness. (Vampire Tales#6/2, BTS) - Andras returned to where The People's Defense Association were meeting that night. (Vampire Tales#6/2) - Coming to question Tom, Angie and Sarran crashed the Association's meeting. Angie spotted Andras in the corner, recognizing his cape, and confronted him. 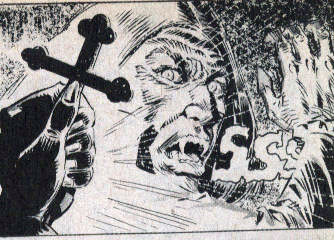 Pulling out a cross, she watched as he recoiled and bared his fangs with a hiss. 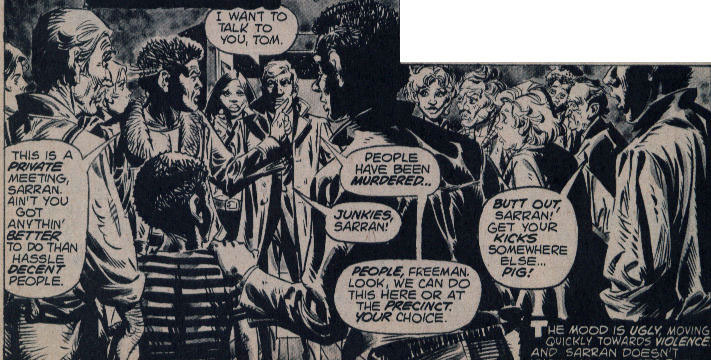 However, Tom pulled a gun and ordered her to put the cross away or he would blow Sarran's head off. After listening to a few minutes of arguing, Andras reminded Tom about their agreement and suggested Angie could fit that role. Tom agreed and slew Sarran when he protested. Angie broke free and fled with Andras unhurriedly pursuing, knowing that there was no one who would help her. Angie spotted the local church and raced towards it, calling out to Father Lyons to help her, but instead he blocked her path, as he too was part of the Association. As dawn began to break behind Angie, Andras spread his arms and cloak to engulf her. Soon after Angie, now a vampire, kneeled on a rooftop crying over the corpse of her current victim, a young boy, while Andras stood impassively behind her, surveying the city behind them. (Bizarre Adventures#25/3 (fb), BTS) - Angie came to terms with her new existence, eventually even revelling in it. When Andras was eventually slain in a fire, Angie continued with the agreement in his place. Comments: Created by Chris Claremont and Andres Balcells (pencils and inks). 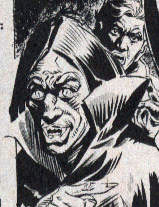 The Vampire entry in the Vampire OHOTMU identified Angie's maker as Andras Juhasz, and provided him with a colored headshot (right). As written, the six week gap between Andras' killings ending in Bavaria and resuming in Harlem can probably be put down to him being shipped to the U.S.A. by sea. 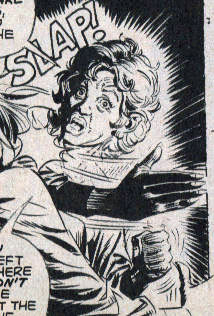 The original tale was set in the early 1970s, but since it ties to another set in the modern era (the time since the F4's first spaceship flight), we may have to presume that Andras' European killing spree may have started in the mid-50s, but went on a lot later than the start of the 1970s. In Blade III#12 a prophecy was fulfilled that brought back all vampires that ever died, presumably including Andras. Willie Hanson started doing drugs while serving in Vietnam. He came home with a load of medals and a $100 a day habit, and no one who cared whether he lived or died. While in Harlem, he ran afoul of the vampire Andras Juhasz, and became his latest victim, managing to rip a button off the vampire's cloak before he died. His body was subsequently found by reporter Angie Freeman and police detective Jimmy Sarran. Formed of the concerned citizens of Harlem, The People's Defense Association of Harlem sought ways to cut the crime blighting their streets. Years of broken promises from the police and city officials taught them to distrust promises from them, until desperation eventually led them to accept a deal with a vampire if that meant a chance at a crime-free neighborhood. They covered for the vampire, Andras Juhasz, appreciating him for cleaning the junkies and muggers off their streets. When Angie Freeman and Jimmy Sarran came looking for information from Tom Freeman, Angie's old friend and former employer Mr. Androitti closed his door in her face, and when the pair later learned about the unholy deal and Angie expressed dismay at her former neighbors, Mrs. Santos accused Angie of abandoning them. When Angie escaped and sought sanctuary in the church, Father Santos apologetically blocked her entrance so that Andras could catch her, reminding her that he lived in the neighborhood too, and that they all had to do their part for the community.